Players in Englewood, New Jersey, and Lake Oswego, Oregon, celebrated with tournaments today. Tempe, Arizona, gets into the holiday spirit this weekend. Division 2 second place finisher Kathy Sutrov next to winner Alan Meyer. 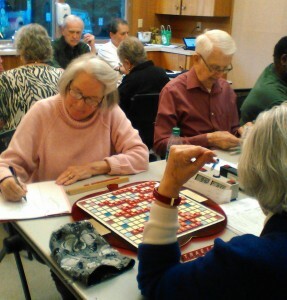 She’s playing Betty Cornelison, who finished third. 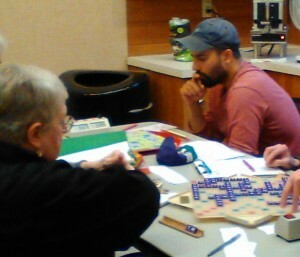 In Lake Oswego, 12 of us participated in a 5-game tournament held at the local adult community center. We had two divisions of 6 players each. The number 4 seed won in each division. That was Alan Meyer in division 2. I was exceedingly lucky and won division 1, Gunther Jacobi was second, and our versatile director Rich Moyer was third. Congratulations to Howard Baldwin, who in his first tournament earned a rating of 1107. Alice Van Leunen and Gunther Jacobi.